Finnish Salmon Soup – Lohikeitto ~ this simple salmon and potato soup is the ultimate 30 minute spring meal, with a light cream broth, melt-in-your-mouth chunks of salmon, and tons of fresh dill! 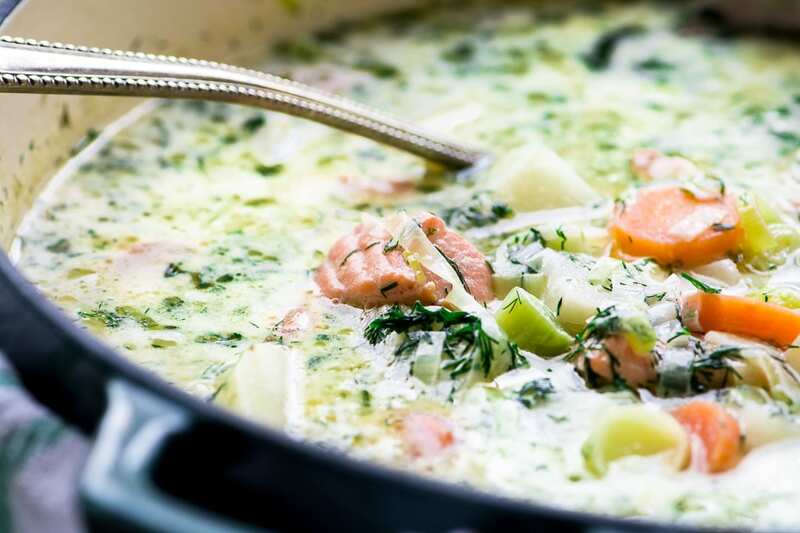 I’m obsessed with anything Nordic right now, including this classic Finnish salmon soup. It’s utterly simple and so satisfying ~ made with fresh spring salmon, chunky potatoes, carrots, and leeks. The flavors are unpretentious and clean, with a traditional dill infused broth touched with allspice. We really shouldn’t sit here gabbing about this one…we need to get cooking! There’s only one hitch to making a great fish soup, and that’s the stock. Most of us don’t have fish stock in the fridge, and you can’t buy it off the shelf, so we need to get creative. One solution is to buy salmon with the skin on. 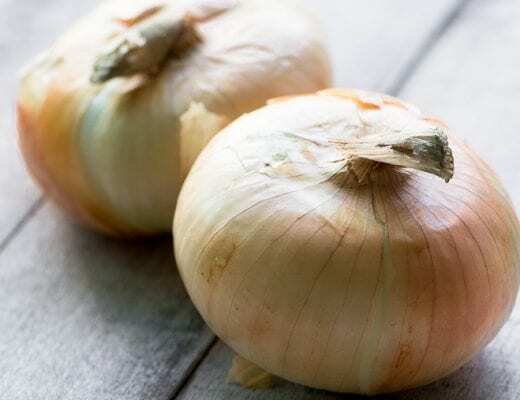 Remove it at home, and use it to make a quick broth. Alternatively you can add the skin the soup while the potatoes and carrots are cooking, and then fish it out later. The good thing is that, like all fish soups, this one gets even better the next day after the flavors have had a chance to develop. There is no shortage of delicious salmon recipes on my blog. We love salmon and eat it more than any other type of fish. 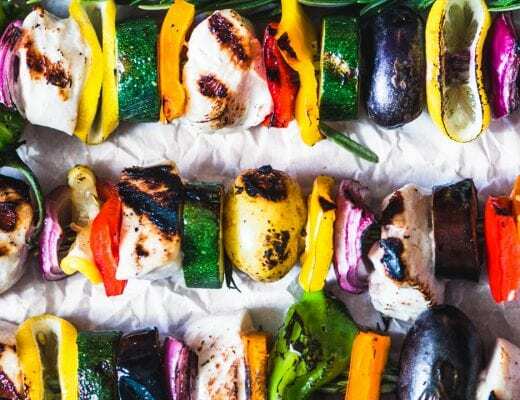 If you love it like I do, make sure to check out my Rainbow Salmon Skewers, I make these so often because they literally take about 15 minutes to throw together. We eat them with couscous or salad. Another favorite spring salmon meal of mine is Salmon and Zucchini Burgers, I serve the warm burgers over a fresh green salad ~ heaven! Strain the broth and add to the pan with the leeks, along with the potatoes, carrots, and half of the fresh dill. Cook for another 10 minutes, or until the potatoes are just tender. Add the salmon chunks to the soup along with the cream and allspice, and gently simmer on low heat until cooked through, just a few minutes. Add the remaining dill, and salt and pepper to taste. This soup makes great leftovers, too, the flavors will mature and get even better! If you can get your hands on great fish stock, by all means use it! Clam broth can also be used. I’ve sometimes even used clam juice as a base for fish soup. Serve this soup with some rustic artisan style bread ~ rye or pumpernickel would be amazing! I have a great recipe for PUMPERNICKEL BISCUITS on the blog which would be perfect with this Finnish salmon soup. Finland is not a part of Scandinavia. It is a Nordic Country. There is a difference which matters to Finns. Lohikeitto is a great soup, and your recipe closely resembles the soup I frequently enjoyed when living in Finland. Point taken, I just corrected myself :) Thanks Anne! Hi. I’m from Santa Monica but my husband is Finnish. We live in Helsinki where this soup is a staple. We normally eat it at restaurants but when it’s made at home, it’s my husband who usually is doing the prep. Tonight he was busy with work stuff so I decided to try a recipe with the intent of blowing him away with my own home prepped Lohikeitto. Yes…an LA gal can make the best salmon soup there is. Thankfully I found your great recipe and it had all the right ingredients. The allspice and bay leaves are a must for extra flavor in the stock. Also, fish stock with a splash of veggie stock is essential. Anyhow, this is an absolute winner recipe and I’ve tasted plenty of authentic Finnish salmon soups. I’m so glad I found your site. :-) I look forward to trying more. I just finished cooking and it’s delicious <3 Thank you for! We bought a whole salmon and filleted it. We boiled the backbone and head and removed the flesh when cold. Then followed the recipe. Great. Thank you! Was great- especially the fish skin broth. I also added one fish fond “du chef” and plenty of salt. Hi. Would this work without the cream? Finnish approved! I was born and raised in Finland and I was raised on this. I grew up cooking a recipe very similar to this salmon soup in school. This is great and authentic Finnish Salmon soup. Be sure to stop by Finland and try out some other Finnish traditional foods like Reindeer! Simple to follow directions led to delicious complex flavors, we loved it! Thank you! I’m so glad you liked it Bridget, I’m hoping to do more Scandinavian food this fall and winter season, I just love it. Omg – my son David (22) home from college – whipped up your salmon soup recipe in no time! He paired it with grilled lobsters & grilled eggplant & zucchini. He cooked the soup so the potatoes & carrots were ‘al dente … and made the fish stock from the salmon skin according to your recipe. He only put in 1/2 the butter though – which we thought made it perfect! He made two batches, it was so good – we sent one quart to our friend/neighbor. We all highly recommend this recipe!!! I have a few cakes with pineapple, Pippa, there’s the Hummingbird bundt or the Hummingbird Bars…let me know if neither of those are what you’re looking for. I had a soup similar to this at the dining room of Hotel Arthur in Helsinki and it was fabulous. All the salmon in Finland was great. I look forward to trying this recipe….Sounds much the same. I can imagine Finish salmon must be the best…hope you enjoy this soup too! May I ask how do you make the broth? Has anyone tried freezing this soup? I have made it a few times and my family loves it. It would be wonderful if I could keep some handy in the freezer for quick lunches. Soups that contain milk or cream, like chowders and bisques, also don’t hold up well in the freezer — they tend to take on a grainy texture and separate when defrosted and rewarmed. While non-dairy milks like coconut milk hold up a little better, soups that are frozen with it still won’t be the same when defrosted either. Follow this tip: Hold back any dairy or non-dairy milk or cream if freezing a soup that calls for it. Then simply add it in when you’ve reheated the soup. Thank you, Sue! This is totally fabulous! I am usually not a big fan of fish…anything. But, wow and WOW! This will definitely take its place in my regular rotation. Since making this, I passed the recipe along to my daughter. It was such a hit that her SO asked for the leftovers for breakfast! This is SO good for breakfast ;) Thanks Judy! I am glad you loved the idea of this soup and decided to make it. It’s one of the best soups I have ever tasted in my whole life! Sue, I made a triple batch yesterday using a whole salmon. My husband filleted and deboned the salmon and I made a quick stock with the skin and bones (added an onion, some celery and peppercorns to the stock) and let it simmer for an hour. This is an amazing soup! Have lots of leftovers so am giving it away and taking it to a dinner to share. Thank you Sue! Oh my gosh, that stock must have been amazing ~ great teamwork! I love everything about this soup! 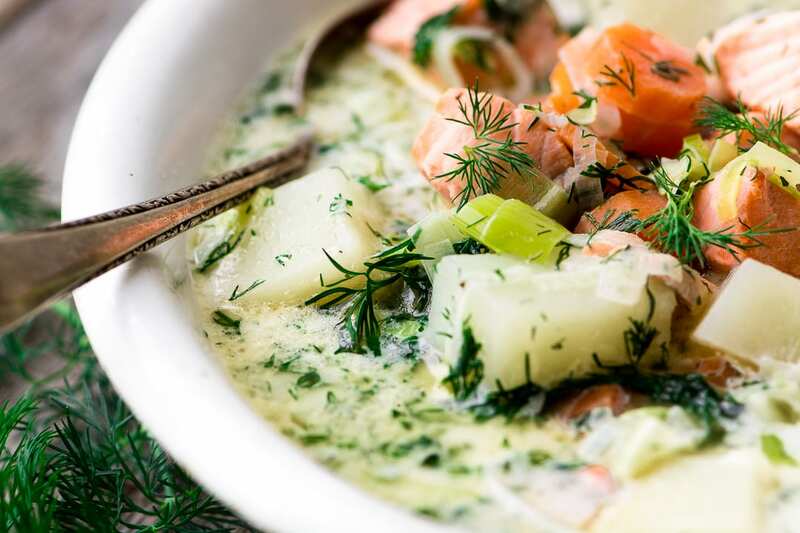 First, such a pretty bowl of soup, but beyond that the combination of potatoes, salmon and dill is bound to be absolutely perfect. Sharing! With all the fresh dill and leeks, this is the perfect spring soup! I have never thought of salmon and chunky potato in a soup…and I love the how it turned out…comforting, filling and delicious. Goodness the description alone sold me! 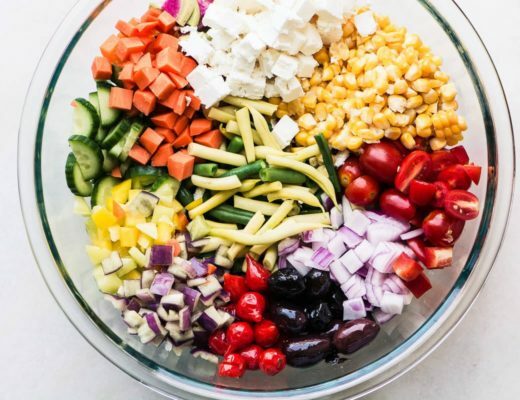 It is a beautiful spring soup that is going on my must-try list! We adore salmon and love all that fresh dill. A beautiful treat. I love soup year round :) Have a terrific weekend! 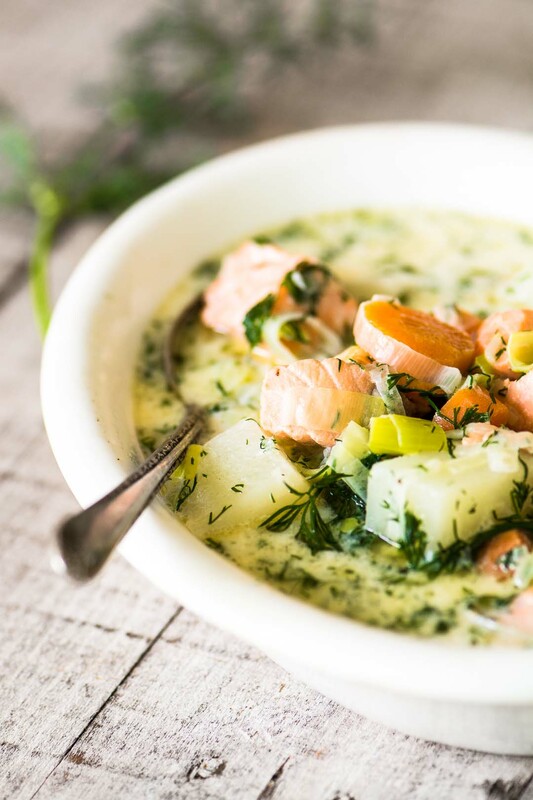 Thanks Tricia ~ my favorite part about this soup is that light creamy dill broth ~ it’s a great way to enjoy salmon! This sounds really good. Seafood stock is available at one of my grocery stores (New Seasons in Portland, OR) and you can also order it online. I’ve seen both Swanson and Kitchen Basics. Thought this might be helpful. Maybe it’s just my regular store, I can never find it ~ thanks Kathy! I love the idea of a spring soup. Hip hip hooray for extending soup season! Salmon and potatoes are a favorite combination here so I know this will be a huge hit. Thanks Sue! Spring soups are some of the best! Have a nice weekend Chris.